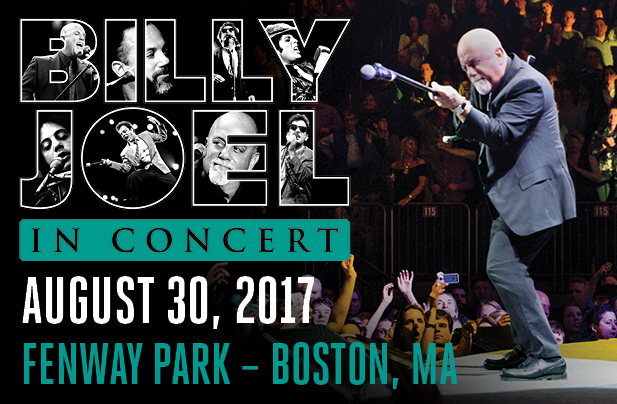 (January 5, 2017, Boston, MA) – The Boston Red Sox and Live Nation are proud to announce that due to overwhelming demand, legendary musician Billy Joel will return to Fenway Park for an unprecedented 4th consecutive year on Wednesday, August 30th, 2017. In appreciation of the artist and his fans, the Red Sox also announced that the August 1st home game against the Cleveland Indians will be Billy Joel Night. There will be a pre-game party, Billy Joel music, and an exclusive co-branded giveaway item celebrating Billy Joel’s concerts at Fenway Park. Complete information will be announced by the team soon. American Express® Card Members can purchase tickets before the general public beginning Monday, January 9 at 10:00 AM through Thursday, January 12 at 10:00 PM. Tickets will be available for purchase by the general public beginning 10:00 AM on Friday, January 13 via RedSox.com/BillyJoel. Billy Joel night at Fenway Park will be August 1st, more details to come. In December 2013, Billy Joel became Madison Square Garden’s first-ever music franchise, joining the ranks of the storied venue’s other original franchises—the New York Knicks, Rangers, and Liberty. Since January 2014, Joel has played one show per month at The Garden as part of the Time Warner Cable Concert Series. This unprecedented and wildly successful residency has led to selling out 40 shows thru April 2017. Billy Joel is one of the biggest concert draws in the world and continues this achievement with an impressive run of sold-out consecutive stadium shows and concert arenas. Having sold 150 million records over the past quarter century, scoring 33 consecutive Top 40 hits, Billy Joel ranks as one of most popular recording artists and respected entertainers in history. The singer/songwriter/composer is the sixth best-selling recording artist of all time and the third best-selling solo artist. In 2016, the Library of Congress selected “Piano Man” for preservation in the National Recording Registry for its “cultural, historic, and artistic significance.” In November 2014, Billy Joel received both The Library of Congress Gershwin Prize for Popular Song which honors living musical artists’ lifetime achievement in promoting the genre of song as a vehicle of cultural understanding; entertaining and informing audiences; and inspiring new generations, and the once-in-a-century ASCAP Centennial Award, which is presented to American music icons in recognition of their incomparable accomplishments in their respective music genres and beyond. In December 2013, Joel received The Kennedy Center Honors, one of the United States’ top cultural awards. He is also the recipient of six GRAMMY® Awards, including the prestigious Grammy Legend Award. Joel has been inducted into the Songwriter’s Hall of Fame and the Rock and Roll Hall of Fame and has received numerous industry awards including a TONY AWARD for “Movin’ Out,” a Broadway musical based on Joel’s music. For his accomplishments as a musician and as a humanitarian, Joel was honored as the 2002 MusiCares Person Of The Year by the MusiCares Foundation and the National Academy of Recording Arts & Sciences. Joel has also performed alongside other music greats at two of Madison Square Garden’s most extraordinary benefit concerts – “12-12-12, The Concert For Sandy Relief,” which raised awareness and money for those affected by Hurricane Sandy and “The Concert for New York City,” which was held to help aid 9/11 victims and heroes. Billy Joel received a star on the Hollywood Walk of Fame in Los Angeles, adding another milestone to his brilliant career.